Only one more week to go in regular season! The top 2 slots in each division go on to the playoffs. In Red Division, there's a 3 way tie on top with Fishing Fanatics nad Lil' Bass Kickers ahead on total points, and amazingly 7 teams just one game behind! 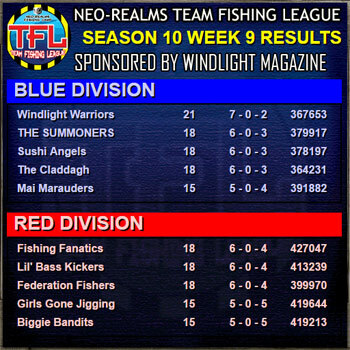 In Blue Division Windlight Warriors have secured a playoff place with 5 teams still battling for the last position. Good luck to all teams on the final week of regular season! Only two more weeks remain in regular season! In Red Division, the Federation Fishers have a one game lead but 6 teams are only 3 points behind in second! 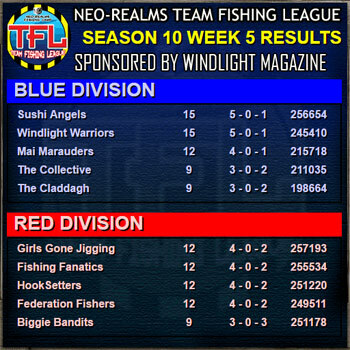 In Blue Division, the lead remains shared between Sushi Angels and Windlight Warriors. But 4 teams remain 3 points off as well. It's shaping up to be an exciting end to the season! 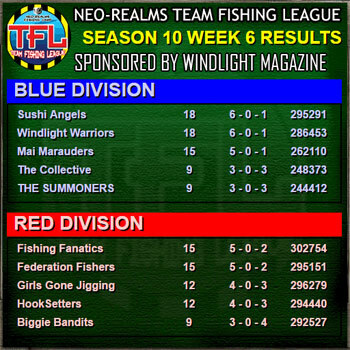 Week 7 is over and Windlight Warriors retain the top spot in Blue Division, but Sushi Angels have a game in hand. In Red Division we have Fishing Fanatics and Federation Fishers and the front, with many teams only one game behind. Good luck to all teams in week 8! Week 6 is over and we're over halfway done with the regular season! 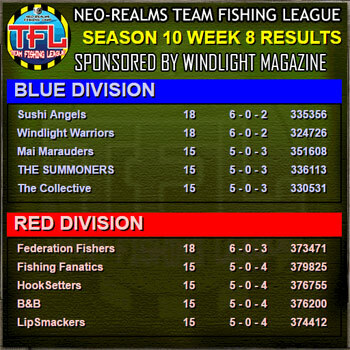 Sushi Angels and Windlight Warriors share the lead in Blue Division, and Fishing Fanatics and Federation Fishers also share the lead in Red Division. At the end of Week 5 it's neck and neck in Red Division, with a 4-way tie for first between Girls Gone Jigging, Fishing Fanatics, HookSetters and Federation Fishers. 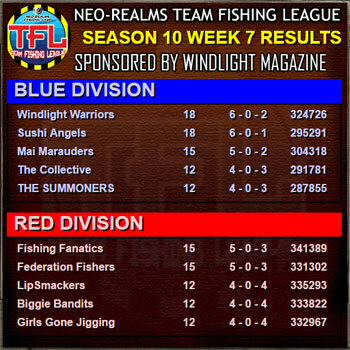 In Blue Division Sushi Angels and Windlight Warriors share the top, with Mai Marauders one game behind.